Jack Kerouac and Emily Dickinson have more in common than you might think. Publishers who didn’t like Dickinson’s unorthodox punctuation blithely changed it without her permission. Similarly, published versions of Kerouac’s poetry differ from what he originally wrote. I recently told my friend Bill, in Alaska, that I was re-reading Jack Kerouac’s haiku. He remembered reading them and mentioned particularly liking one that had something to do with the uselessness of rain falling into the ocean. I consider that haiku among Jack’s best, so I decided to look it up to see exactly what it said. In addition to his Book of Haikus, I recalled Kerouac’s haiku appearing in a couple of other books that I own. I pulled them out and was surprised, actually astonished, to discover that the poem appears three different ways, with different punctuation and different line breaks, and it is in no way obvious which version, if any, represents what Kerouac actually wrote. Here they are. 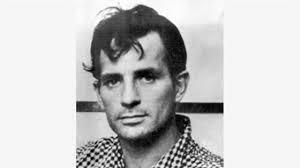 As all three books were published posthumously, we know Kerouac didn’t get to go over the proofs. For such a short poem, there are quite a number of discrepancies. In the Scattered Poems version, the line breaks after “rain” but in the other two versions it breaks after “driving.” The exclamations that appear in Pomes and Haikus are in different places. It makes me wonder if Jack would have ended a poem with an exclamation point. He might have. In the Haikus version, the line “Useless! useless!” carries a much different connotation than the line “Useless, useless.” To me the opening line without exclamation points suggest an acceptance of the facts, more in line with Kerouac’s much-espoused interest in Buddhism. The line with two exclamation points in Haikus connotes some different sort of emotion (frustration? exasperation? surprise?). On the matter of indenting, again it’s 2 to 1, leaving us to wonder what’s written in the original little pocket notebook. A high proportion of the poems in Haikus have an indented second line (and the first letter of the first and third lines capitalized). Did Jack write them that way? Of the three versions, I much prefer the one without exclamation points. They are rarely effective in poems and bring to mind an overly-romantic middle-schooler who dots “I”s with a heart. Given that the Scattered Poems version has the shortened second line I don’t mind the word “the” which does not appear in the other two. By the way, note the ending punctuation—a period, an exclamation point, and nothing. This isn’t the only poem with authenticity issues, but we won’t know what Jack actually wrote until some interested scholar gets into those notebooks to see what’s written in his own penciled hand.